Earnings season took a dark turn on Wednesday, when the majority of companies reporting numbers for the December quarter missed on sales and lowered their outlook for the rest of the year. Coming after Apple Inc.’s AAPL, -4.81% revenue miss from late Tuesday, the news was a grim reminder that corporate America is struggling to generate growth after years in which massive sums were spent on share buybacks instead of investing for growth. 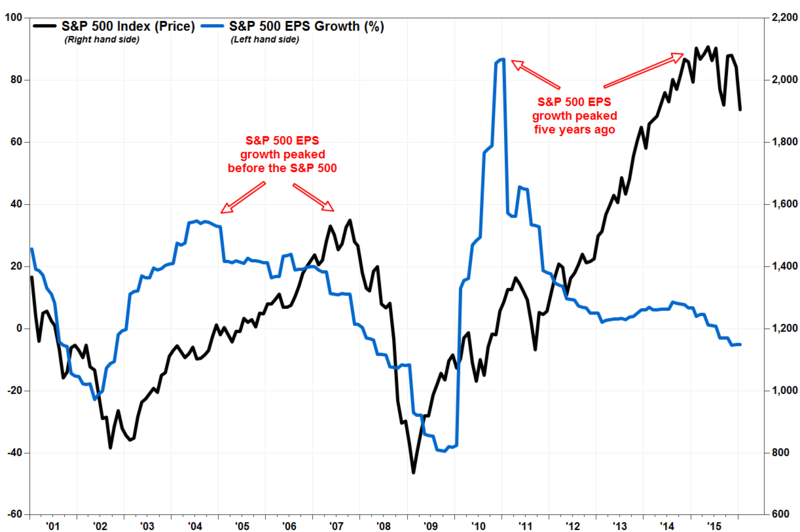 This weakness in overall corporate earnings growth could bode badly for the broader stock market, as it represents the actual impact of geopolitical concerns, the slowdown in China, the weakness in oil prices and productivity, said Karyn Cavanaugh, senior market strategiest at Voya Investment Management. Among Dow Jones Industrial Average DJIA, -0.02% components, Boeing Inc. BA, -7.86% offered guidance for 2016 that fell way below current expectations, forecasting a slowdown in commercial airplane deliveries for the year. United Technologies Inc. missed revenue by a staggering $1 billion as all units suffered declines. Elsewhere, companies reported sharp declines in profit. Fiat Chrysler FCAU, -1.05% profit fell 40%, Ferrari N.V. RACE, -0.25% profit slid 34%, Novartis A.G. NVS, -4.42% profit fell 57%, Hess Corp. HES, +10.41% said its loss deepened to $1.82 billion from $8 million a year ago and Norfolk Southern Corp. NSC, +2.37% said it would cut 2,000 jobs and downsize its rail lines after profit tumbled a worse-than-expected 29%. On the top line, U.S. Steel Corp. X, -14.03% sales fell 37%, Tupperware Brands Corp. TUP, -11.95% sales fell 13%, State Street Corp. STT, -2.88% revenue fell about 5% and Cliffs Natural Resources Inc. CLF, +1.32% revenue fell 54%. On Tuesday, Johnson & Johnson JNJ, +1.63% Procter & Gamble Co. PG, +0.96% DuPont Co. DD, -0.22% Coach Inc. COH, +4.98% Corning Inc. GLW, +2.12% and Freeport-McMoRan Inc. FCX, +18.57% all missed revenue estimates for the December quarter. 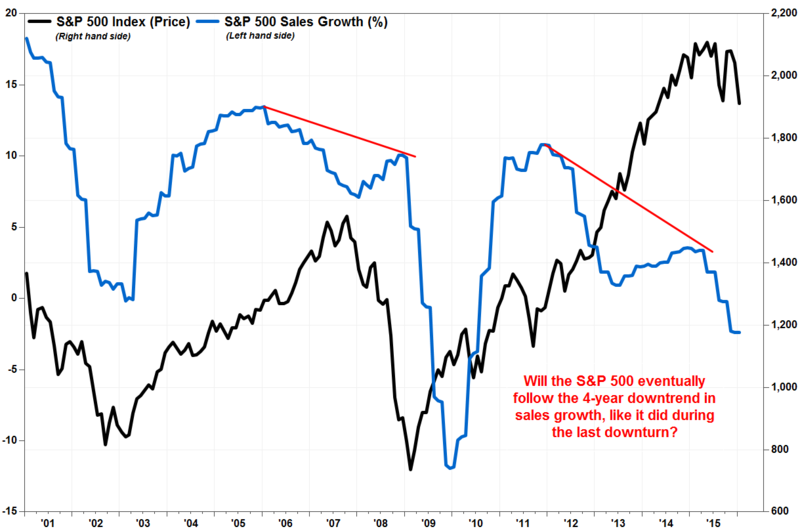 The S&P 500 is on track for its fourth straight season of negative sales, according to FactSet data, the longest such negative streak since the four-quarter stretch from the fourth quarter of 2008 to the third quarter of 2009. The S&P 500 index SPX, +0.27% has fallen 7% in the last 12 months. So far, 22.4% of S&P 500 companies have reported, and the index is looking at a median decline in sales of 3.6%, wider than 3.5% reading a day ago, according to FactSet. That’s the data provider’s blended growth rate, which includes those companies that have reported as well as the estimates for the rest. Per-share earnings are looking at a deeper decline of 6.3%, wider than the 6.2% reading on Tuesday, according to FactSet. That would be a third straight quarter that earnings decline. The decline in earnings could hurt share prices more than it did last year. Considering the Federal Reserve has started tightening the stimulus spigot by raising interest rates last month, Cavanaugh said investors have to start looking at earnings more critically than they have been.